Part Time Jobs in Prayagraj at Amar Ujala Walk in Interview, Prayagraj ( official job in Allahabad) Latest Jobs for 12th pass, ITI Fitter Jobs in Amar Ujala, Age 18 to 25 Years, Salary 8000+ per Month, Time to attend walk interview. 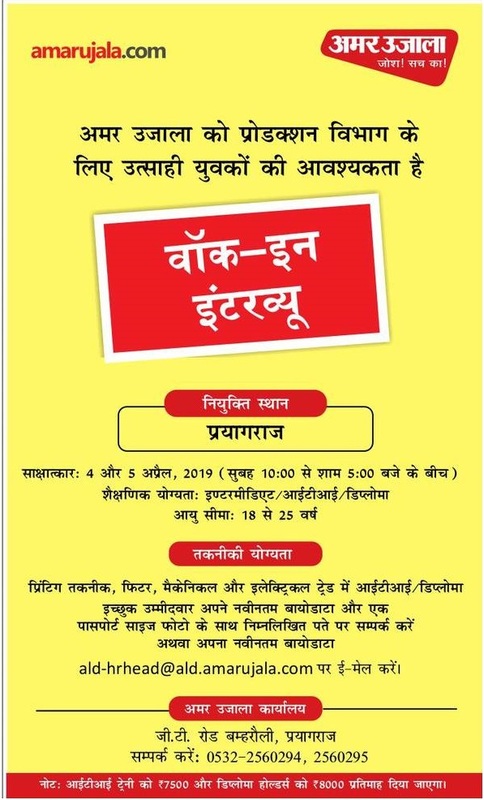 Amar Ujala Production department has invited young aspirant to attend walk in Interview for fresher. If you wanted to get jobs in Journalism and becoming Patrakar (Meaning in English Journalist) is one way opportunity to fly on Media Dream. So over out your dream shadow and Check this Amar ujala Jobs opening for fresher’s. Meaning age to join in Amar Ujala Freshers call is 18 to 25 years of age. Age Relaxation is given to candidates who are local and have experience in media, Internet things, computer Knowledge. 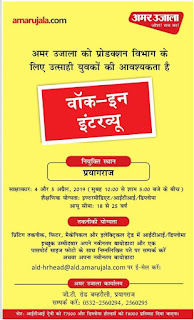 Department: Jobs hiring is in Department of Amar Ujala Production Department. Walk in Interview Amar Ujala: Through below e paper amar ujala you can get some detailed information, later we will also posted next job opportunities for youngsters who are searching new opening in Amar Ujala, Dainik Jagran, and Hindustan Newspaper etc. Name of the Posts: Printing, Fitter, Mechanical, Electrical Trade and ITI Diploma in related posts. How to apply: Interested and Eligible candidates who have all related document regarding jobs Interview in Amar Ujala than visit before last date of Walk in Interview which mention below. Interview Date: 4 April, 5 April 2019. Main Eligibility: 12th pass, Graduate Pass or ITI in Preference. Document required attending walk in interview: You can also send your resume to ald-hrhead@ald.amarujala.com email address. Or directly visit to that place. Amar Ujala Office: GT Road Bamrauli, Prayagraj. Sampark: Contact Number 0532-2560294, 2560295. Salary: ITI Trainee Rs 7500 and Diploma Holders Rs 8000 per month. Timing to attend walks Interview. Morning 10.00 IS to evening 5 PM.